LG's Tone Studio are powerful speakers that go around your neck. Use them for good. Whatever you do, don't wear LG's Tone Studio speakers on the subway. Please. The company's new neck-mounted speakers are surround sound for your face, putting you smack in the middle of a movie, TV show or game -- complete with haptics. At CES this week, LG introduced the Tone Studio and the Tone Free, a pair of true wireless earbuds that join the Apple AirPods, the Samsung Gear Icon X and probably a dozen other competitors popping up like little wireless mushrooms here at CES. The Tone Free are okay, sure, but there's nothing like the Tone Studio. 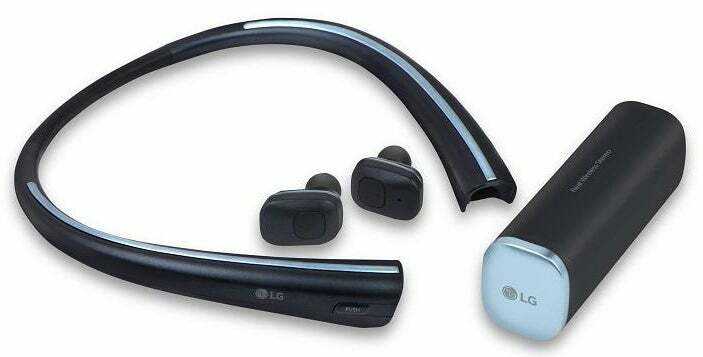 LG has had neckbuds for years; Bluetooth stereo headsets that go around your neck, with little earbuds that extend up from the main body. The Tone Studio has the traditional buds, for discreet use, but also has two speakers facing up and two facing down on the neck-mounted portion. The speakers run for about three hours before they need a charge. That gives you full, four-channel surround sound pointing up at your ears. The downward-facing speakers deliver rumble, judder and thud directly into your collarbone. LG showed them to me with some classical music, an action movie and a game, and they were very much like wearing a sound helmet. The stereo effect was especially striking. I already want one. I live in an apartment with several other people, and I like to listen to the TV loud. I'd love to have my own little sound bubble that doesn't fill the room, and yet doesn't give the closed-in feeling you get from headphones. As the Tone Studio is going to work best with video and gaming, the trick is going to be syncing these with TVs. TV Bluetooth support is notoriously bad; even if TVs have Bluetooth, often it's implemented poorly enough that latency becomes a real issue, with sound and video falling out of sync. You can pair two units to one source for multiplayer gaming or so two people can watch movies together, which is going to require more low-latency synchronization. Working with older TVs is the bit LG hasn't quite figured out yet, but it's working on it. The Studio works fine with the past two years' worth of smart TVs from LG and Samsung, as well as with phones and tablets. The company is trying to source a good, low-latency Bluetooth dongle to work with less expensive and other brand TVs, as well as game consoles that don't support Bluetooth. That may be why the Tone Studio's price and release date are a little bit in question: they'll cost $200-$250, and come out sometime in February, LG said. 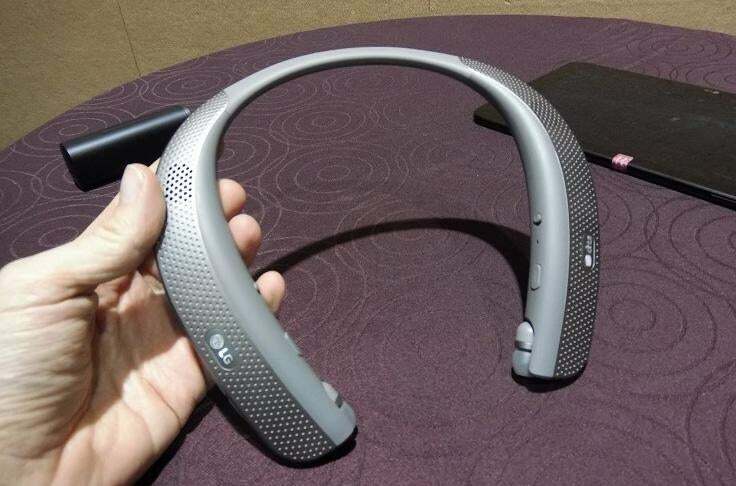 LG also showed off its Tone Free earbuds, which also deliver notifications to your ears. The innovation here is that they come in two kinds of battery cases: one is a neckband, and the other is a little rectangular box. Both cases recharge the earbuds, which have about 3 hours of use per charge. I've been wearing Samsung's Gear IconX earbuds for a few weeks now, and the Tone Free aren't quite as comfortable at first glance; they have a boxlike chunk which extends up into your ear a bit, and doesn't feel as secure as the IconX. They have longer battery life than the IconX do, though, and they don't hang down and look like ridiculous sideburns the way Apple's AirPods do. I couldn't test the sound quality as the Tone Free units I was checking out were nonfunctional. The Tone Free will come out in February for $199.